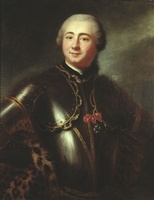 LEGARDEUR DE CROISILLE (Croizille) ET DE MONTESSON, JOSEPH-MICHEL, officer in the colonial regular troops and seigneur; baptized 30 Dec. 1716 at Bécancour (Que. ), son of Charles Legardeur* de Croisille and Marie-Anne-Geneviève Robinau de Bécancour; d. c. 1776 in Pennsylvania. 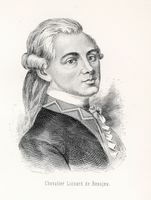 Joseph-Michel Legardeur de Croisille et de Montesson grew up on the seigneury of Bécancour, where equal numbers of Canadians and Christian Abenakis lived side by side. This background probably explains how he gained the linguistic and social skills that enabled him to act as liaison between Canadians and Indians during his military career. In 1739, as a cadet, Montesson was part of the force of Canadians and Indians that travelled to the lower Mississippi valley to assist Louisiana in its wars against the Chickasaws [see Jean-Baptiste Le Moyne* de Bienville]. He was promoted second ensign in 1742. 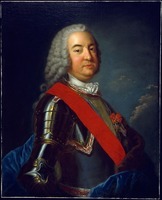 In 1746 he was with Jean-Baptiste-Nicolas-Roch de Ramezay’s expedition against the British in Acadia. He led a raid on a British provisioning party at Port-La-Joie (Fort Amherst, P.E.I.) in July. The raiders, mainly Micmacs, killed or captured almost 40 of the enemy at slight cost to themselves, and Montesson was commended for having distinguished himself in his first independent command. In August, while conveying a cargo of provisions across the Bay of Fundy, his small vessel was run aground and wrecked when pursued by a British ship. On 25 Oct. 1745 at Quebec he had married Claire-Françoise Boucher de Boucherville, widow of Jean-Baptiste Pommereau*. The marriage involved him in the seal fishery at Gros Mécatina, which Pommereau had carried on in association with Guillaume Estèbe and Daniel-Hyacinthe-Marie Liénard* de Beaujeu. Their concession expired in 1747 but was renewed for six years dating from 1748, with Montesson acting on behalf of his wife. Made full ensign on 15 Feb. 1748, he was one of several interpreters at an important negotiation between the Iroquois and the Canadians at Montreal that autumn [see Kakouenthiony*]. When Governor Duquesne decided to send a fort-building expedition to back up the Canadian claim to the Ohio country, Montesson was made a member of the advance detachment under Charles Deschamps de Boishébert which left Montreal in February 1753. Reports of Montesson’s quarrels with Boishébert angered the governor, who considered recalling him. Unaware of Duquesne’s displeasure, the minister of Marine promoted him lieutenant on 1 April 1753. He remained with the expedition, and during August and September his special responsibility was directing a small squad building dug-out canoes. The following year he coordinated assistance being given to the expedition by a party of Abenakis and made at least one trip to the site of Fort Duquesne (Pittsburgh, Pa) with supplies. In that year also he acquired an island which had originally been part of the seigneury of Becancour, and in 1755 he purchased the seigneury itself from his mother. During the Seven Years’ War Montesson’s tasks were varied: providing liaison with Abenaki allies in 1755, reconnoitring by night around Fort Carillon (Ticonderoga, N.Y.) and guarding the signal station at Kamouraska in 1758, retiring guns from the Île d’Orléans and commanding small squads being moved about Quebec City’s outskirts in 1759, and recruiting residents of the south shore for the last big effort in 1760. He had been promoted captain on 1 May 1757. In 1761 he went to France and received the cross of Saint-Louis. He may have been considering resettlement there, but by New Year’s 1764 he was back in Canada exchanging greetings with Governor Murray of Quebec. One of his stepdaughters married John Bruyères, secretary to the governor of Trois-Rivières, in a Protestant ceremony; the other married a British officer. Nevertheless Montesson was not employed by the new régime until 1775, when with other seigneurs he rallied to defend the government against the American invasion. (The Bécancour militia, however, refused to be called up.) Montesson was a civilian volunteer at Saint-Jean when the fort there was captured on 3 Nov. 1775. Prisoners were sent to Pennsylvania, and Montesson died before an agreement of 1777 permitted the men taken at Saint-Jean to return home. Writing in 1753, Governor Duquesne castigated his “spirit of insubordination, proceeding from his having independent means” and called him “a busybody, a shameless liar, and very difficult to get along with.” Montesson may not have been an attractive personality, and he may have tolerated members of the British occupation force within his family circle, but he showed himself ready to defend Canada against all comers, in the 1770s as in the 1750s. AN, Col., C11A, 85; F3, 14, 15. ANQ-Q, NF 6, 4, pp.300–5, 321–26 (PAC transcripts). Library of Congress (Washington), George Washington papers, 9, 19, 20, 21, 22, 34, 42. PAC, RG 4, D1, 7. [G.-J. Chaussegros de Léry], “Journal de Joseph-Gaspard Chaussegros de Léry, lieutenant des troupes, 1754–1755,” ANQ Rapport, 1927–28, 365, 375. Coll. des manuscrits de Lévis (Casgrain), VII, VIII. Inv. de pièces du Labrador (P.-G. Roy), I, 88–89. [D.-H.-M. Liénard de] Beaujeu, “Journal de la campagne du détachement de Canada à l’Acadie et aux Mines, en 1746–47,” Coll. doc. inédits Canada et Amérique, II, 16–75. “Mémoire du Canada,” ANQ Rapport, 1924–25, 154. NYCD (O’Callaghan and Fernow), X, 186–88. Papiers Contrecœur (Grenier). “Recensement du gouvernement de Trois-Rivières, 1760,” 52–53. “Une expedition canadienne à la Louisiane en 1739–1740,” ANQ Rapport, 1922–23, 181–82. Æ. Fauteux, Les chevaliers de Saint-Louis. P.-G. Roy, Inv. concessions, I, 251–57. P. E. LeRoy, “Sir Guy Carleton as a military leader during the American invasion and repulse in Canada, 1775–1776” (unpublished phd thesis, 2v., Ohio State University, Columbus, 1960). Marcel Trudel, “Les mariages mixtes sous le Régime militaire,” RHAF, VII (1953–54), 7–31. Malcolm MacLeod, “LEGARDEUR DE CROISILLE ET DE MONTESSON, JOSEPH-MICHEL,” in Dictionary of Canadian Biography, vol. 4, University of Toronto/Université Laval, 2003–, accessed April 24, 2019, http://www.biographi.ca/en/bio/legardeur_de_croisille_et_de_montesson_joseph_michel_4E.html.